The diagnosis of CS is made according to the operational criteria established by the 2000 International CS Consortium (Table 1). CS overlaps with several other hamartomatous with CS. FIGURE 1 Postauricular trichilemmomas in a patient with Cowden syndrome. Courtesy of Dr. Terence O'Grady, University of California San Diego. FIGURE 2 Trichilemmomas coalescing to form the characteristic cobblestone pattern on the oral mucosa of a patient with Cowden syndrome. Courtesy of Dr. Terence O'Grady, University of California San Diego. 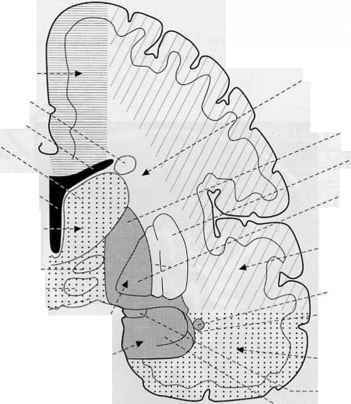 syndromes, including BRR and LDD. LDD was once considered a distinct entity, but it is now thought to be a neurologic manifestation of CS, due to reports of mutations in the PTEN gene in patients with LDD. BRR has also been reported to have mutations in the PTEN gene, explaining the significant clinical overlap seen between BRR and CS, but lacks the high penetrance of cancer seen with CS. Biopsy of the skin lesions to confirm the diagnosis of trichilemmomas is necessary, since their clinical appearance is nonspecific. The differential diagnosis of multiple facial trichilemmomas includes benign warts, angiofibromas, multiple fibrofolliculomas, and multiple basal cell cancers. 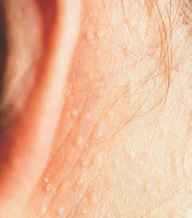 Less commonly, the facial papules seen in CS can be mistaken for syringomas, steatocystomas, or even neurofibromas.